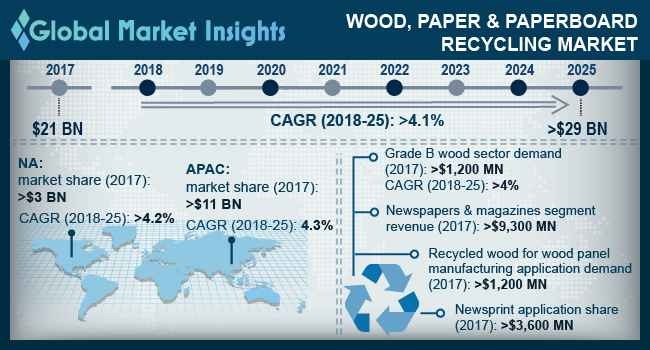 Wood, Paper & Paperboard Recycling Market size will exceed USD 29 billion by 2025; according to a new research report by Global Market Insights, Inc.
Wood recycling is process, where waste wood, which is generated from various end-users is further recycled for fresh use in distinguished end-users. Used paper & paperboard products are further recycled to reduce the cutting down of trees, which will positively impact the cutting down of forest trees. Waste paper & paperboard is generated on higher volumes across the world, and if all this volume is recycled, the need for new paper will be reduced, thereby benefitting the environmental conservation. Increasing demand for wood panels will significantly trigger the demand for wood recycling practices over the projected timespan. Moreover, increasing demand for waste wood for energy generation in end-user industries such as ceramic, brick manufacturing will also improve the demand for recycled wood over the coming years. Rising environmental concerns regarding the cutting of plants, will significantly impact the paper & paperboard recycling market in the next years. Additionally, decreasing resources for the manufacture of new paper is also an additional factor responsible for the growing need for paper & paperboard recycling. High costs involved in paper recycling, coupled with lack of waste collection facilities in developing nations will significantly affect the increase of wood, paper & paperboard recycling market till the end of 2025. The demand for grade B wood recycling is predicted to cross USD 1,700 million, by the end of 2025, at a CAGR of more than 4.1%. Mixed grade paper & paperboard recycling market will surpass USD 2,200 million by the end of 2025, increasing at a CAGR of nearly 4.3%. Wood recycling market for energy generation will cross USD 630.0 million by the end of 2025, growing at 3.9% CAGR. Paper & paperboard recycling market for packaging will surpass USD 4,400.0 million by the end of 2025, rising at CAGR nearly 4.7%. North America wood, paper & paperboard recycling market is predicted to surpass USD 4.4 billion by 2025, increasing at a CAGR of over 4.2%. Regional growth is positively influenced by government initiatives towards sustainable practices. Asia Pacific wood, paper & paperboard recycling market has the lion’s share of global market over the entire forecast period. This market will surpass USD 15.8 billion by 2025, at a highest CAGR of nearly 4.3% throughout the forecast timeline. Some of the prominent players in global wood, paper & paperboard recycling market are Evergreen Paper Recycling, American Paper Recycling Corp., Global Waste Recyclers Ltd, Huron Paper Stock, and National Paper Recycling among several others.